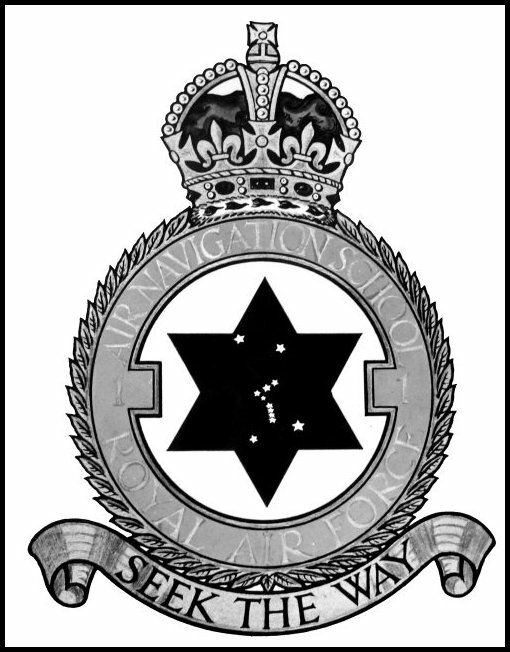 The large background star of the 1 ANS badge symbolised navigation, upon which the constellation of Orion was imposed. Orion - the great hunter - was used specifically to suggest the part played by navigators in finding the way to the enemy. The stars were sized to indicate their brightness, with the bottom right-hand star (Rigel) the largest. No.1 Air Navigation School (ANS) was formed on 9th April 1947 by renumbering No.5 ANS at RAF Topcliffe. 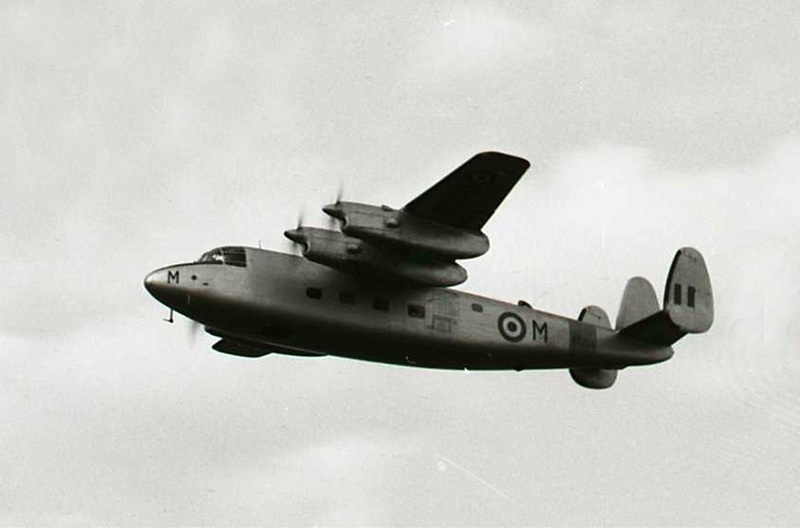 In its early days the School operated 21 Wellington T.Mk.X and 16 Anson Mk.1 aircraft, but the the Ansons were replaced during January 1949 with the later T.21 version. On 7th July 1949 No.1 ANS moved to RAF Hullavington within No.21 Group and by January 1954 was operating a mixed fleet of Ansons, plus Valetta T.3 and Varsity T.1 trainers. No.1 ANS was commanded by Gp Capt JA Field. The unit received six Marathon aircraft (XA256, XA259, XA266, XA268, XA270 and XA272) from 5th to 7th January 1954 and this coincided with the transfer of the Ansons to storage at 20, 22 and 23 Maintenance Units (MU) during the same period. There were roughly 115 pupil navigators under training at the start of January, falling to 88 at the end of the month. This was a deliberate move, since Hullavington was due to receive an Elementary Flying Training School (2 FTS from Cluntoe), and navigator training was in turn to transfer to Thorney Island. In prepration for this, a conference was held at Hullavington on 19th February to discuss the posting of personnel to cover the change of role. Despite this, training continued, though the Marathon aircraft appear to have had little, if any, use since there are no flying times for the type in the unit records, while there most definitely are for the Varsities and Valettas. The Varsity aircraft did a great deal of training (1083 flying hours in February against just 84 for the Valettas), four of the type departing to Idris in Egypt on 26th February for a long-range navigation training sortie for instance. A further four repeated the sortie on 5th March. The Marathons were transferred to No.2 ANS at Thorney Island on 4th March (four aircraft), 11th March and 25th March (the latter two being single aircraft). They had been with 1 ANS for just two months. The final group of trainee navigators at Hullavington were part of No.38 Course, which graduated on 5th May even though 1 ANS had officially disbanded on 30th April. On 15th March 1957, No.1 ANS re-formed at RAF Topcliffe in No.25 Group as a result of the cessation of RAF navigator training in Canada. The unit would train Radio Observers, who, as NCO fighter A/I operators, would complete a 20-week course. Experienced navigators would also pass through No.1 ANS, to undergo refresher training after periods away from flying, in much the same way as they had done at Thorney Island. Pupils who had not completed their training at Thorney Island during this changeover period were transferred to Topcliffe, with No.7 Radio Observers Course arriving on 19th March and fifteen cadets from No.6 Radio Observers Course on 27th March. Staff from No.1 ANS had been attached to RAF Thorney Island early in 1957 for familiarisation with the organization and administration of courses, and the Station Commander designate of RAF Topcliffe, Wg Cdr JJK Fleetwood, DSO and OC Flying, Wg Cdr JL Nunn, DFC were detached there from 5th to 22nd February for conversion onto Vampire and Valetta aircraft. No.1 ANS initially equipped with a mixed fleet of four Valetta, two Vampire T.11, nine Vampire NF.10 and the Marathons, eleven of the latter being received in March, mainly from No.2 ANS at Thorney Island. By the end of March, No.1 ANS had a personnel establishment of 87 officers, 65 airmen/aircrew and 644 airmen in ground trades. During that first month of operations no training task was set for the unit, which from a flying point of view concentrated on air tests of its new equipment. 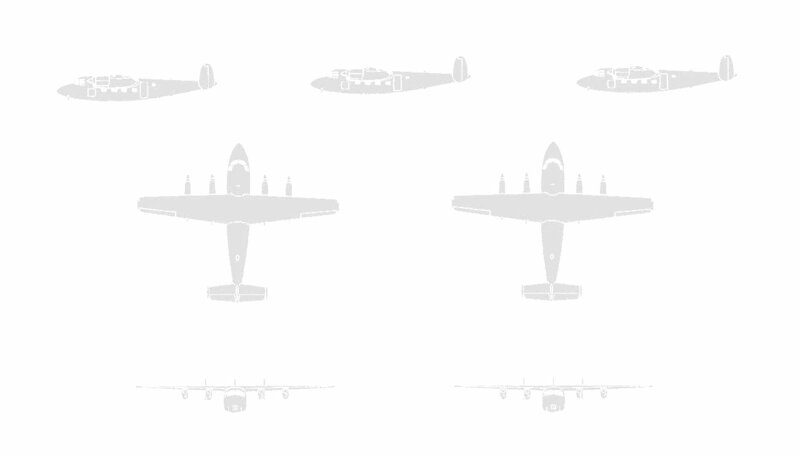 Fourteen Marathon sorties were completed, for a total of 23.05 flying hours. But it would be fair to say that Marathon operations at Topcliffe were not a happy affair; in a far shorter period of operations, No.1 ANS lost many more Marathon aircraft to accidents, incidents and structural degradation than did its fellow unit at Thorney Island. Even during the initial acceptance checks upon arrival, five Marathons had been placed Cat.3 for repair due to cracked angle brackets, with two further aircraft unserviceable. Matters were certainly not helped when on 27th March, during a routine servicing, the landing gear of XA255 was retracted on the ground. It was placed provisionally Cat.3 for repair but never returned to service. Instead it was recategorised as a ground training airframe in August 1957 as s/n 7465M. Radio Observer training began in April of 1957, though aircraft unserviceability restricted the unit's flying. In addition there was a lack of dual-control Marathon aircraft on the unit and this hampered the need to carry out conversion training for the staff pilots. As a result, with just one dual-control Marathon, No.1 ANS did not complete its non-functional training commitment for the month. Meanwhile personnel set-to in the construction of demonstration rooms within Training Wing and received twelve cadets to begin No.8 Radio Observers Course on 16th April. Sadly, the precedent set with the loss of XA255 on 27th March was continued. On 30th April, XA266 was damaged when its undercarriage was retracted on the runway, and it was provisionally assessed as Cat.4. Re-categorised Cat.3 it was returned to Woodley and repaired by Handley Page and returned to Topcliffe in December. Before the end of 1957, two further Marathons were lost to service, XA256 having its undercarriage accidentally raised in the hangar on 30th October and XA250 suffering an undercarriage collapse on landing at Topcliffe on 10th December. Neither were repaired. Further, XA251 was found to have a failed main spar in November and it too was subsequently scrapped. The unit was now separated into squadrons, with No.1 Squadron operating Marathons and No.2 Squadron the Valetta and Venom Aircraft. No.2 Squadron further divided its operations into Vampire Flight and Valetta Flight. During May, No.1 Squadron was finally able to complete the majority of its staff conversion, only one pilot failing to gain his instrument rating on the Marathon. A shortage of crews was however felt to be an impending issue when flying intensified during the summer months. Several Vampire pilots from No.2 Squadron also completed familiarisation in the Marathons during the month, to enable them to experience Gee and BABS letdowns. Concurrently, Topcliffe had initiated a modification to its Marathons, which was formalised as Flying Training Command Mod.13 and embodiment in all of the unit's aircraft was complete during May. This modification seems to have been associated with Mod.1093, the reinforcing of the pedestal casting in the elevator control circuit at Frame 38 in the rear fuselage. Problems with maintaining oil pressure on the Marathon's Gipsy Queen Mk.172 engines was also noted during the month and oil filter cleaning was increased in frequency from every 200 flying hours to just 100 hours in an effort to overcome the issue. Flushing of the engine oil tanks was also doubled in frequency and improvements were straight away noted. It was just as well, since just 12 Marathons were on unit strength at this time, against an establishment of 17 aircraft. Rectification therefore had to be done out of normal working hours and the flying task for the type was limited to just 500 hours in June, and even then just 400 were actually achieved. As ever, the unsung maintenance crews worked long hours and worked miracles, In June a civilian working party from DeHavilland arrived on station to assist in Marathon modification. No.42 Navigator Refresher Course commenced on 18th June, comprising eight officers. During July, XA256 was found to have a cracked rudder lever mounting and all aircraft oof the type were immediately grounded for inspection and then slowly returned to service as they were found to be acceptable. Topcliffe's oldest Marathon subsequently had its rudder mounting removed and the item was sent to Handley Page for further testing. Amid this activity, on 30th July XA274 suffered another undercarriage collapse on landing. It was assessed as Cat.4 but repaired on site by a Handley Page working party. XA274 did not return to service until May 1958 but went on to become the world's last airworthy example of the type. The summer of 1957 marked a particularly poor rate of serviceability though the Marathons were still able to give air experience flights to Air Training Corps cadets during their August summer camps. But the high accident rate was more of a concern and led to a visit by the AOC No.25 Group, Air Vice-Marshal HH Brookes on 23rd August when he spoke to all pilots on the subject. His efforts appear to have had little effect. September 1957 brought a bout of influenza and poor weather, meaning that just 312.15 Marathon hours were recorded for No.1 Squadron against a target of 432 hours. Nevertheless the unit was able to supply five aircraft for static display at other units' Battle of Britain displays on the 14th of the month. These statically-displayed aircraft are undoubtledly the reason for the relatively good photographic coverage of 1 ANS Marathons. From 16th to 19th September the CFS Examining Wing visited Topcliffe and 11 Marathon pilots were checked; 3 at night and 8 during the daytime. High average assessments were recorded. Prior to October 1957, maintenance of No.1 ANS aircraft had been done centrally, by multiple-speciality tradesmen. Under this scheme, Technical Wing would take charge of any maintenance and as a result, Marathon aircraft from No.1 Squadron would be repaired alongside the Vampires and Valettas of No.2 Squadron and often by the same men. It was therefore no great surprise to discover that having individuals responsible for three different types of aircraft, with different types of engines, fuel, spares and systems was a flight safety hazard. As a result, during October the ground crews were absorbed into the individual squadron organizations and now they specialised on just one type, separately under either Marathon Servicing Squadron or Vampire/Valetta Servicing Squadron. Bizarrely, on 1st January 1958 the station would revert to Centralised Servicing. Meanwhile on 25th October the Valettas of No.2 Squadron had completed the first 1 ANS long-range training flight, on this occasion to Malta. The aircraft returned on 29th October. It would appear that Topcliffe's Marathons did not undertake similar overseas sorties. But throughout this period it is worth remembering that despite the numerous incidents and challenges, the training continued. On 9th October No.44 Navigation Refresher Course completed its training and on the 15th, No.9 Radio Observer Course graduated. The latter were reviewed by Gp Capt LM Laws, OC of Church Fenton upon their passing-out. Additionally, Topcliffe's first Acclimatisation Course - No.86 - commenced on 2nd October with 7 officers and was followed by No.87 Course before the end of the month. Toward the end of the year, fog, snow, rain and an icy runway curtailed flying further. The OC No.1 Squadron, Sqn Ldr PG Hill relinquished command on 30th November and Sqn Ldr G Moss then assumed command. He was the third encumbent since March of the same year. On 26th November, No.11 Radio Observer Course graduated with eight cadets. This was the last such course to be undertaken at Topcliffe, with training of Radio Observers being suspended indefinitely. In their place, No.1 ANS began preparing for the first all-through Navigation Refresher course, which commenced on 11th December with 16 Acting Pilot Officers. During December a new Marathon issue was identified - this time the problem was that the aircraft's Rebecca aerials were breaking off in flight. It seemed the aircraft had few friends at this time and it is easy to see why: for various reasons, No.1 ANS had managed in just nine short months to remove five Marathons from service and unfortunately it was a trend that continued into 1958. For No.1 ANS, 1958 began with more snow and ice, to the point that a rum issue was made to the airmen. Across the station, snowploughs were out in force and on many days the temperature stayed resolutely below zero. The weather further restricted the 315 hours of training flights that had been planned for the Marathons in January; just 192 were achieved. Nevertheless, No.49 Refresher Course was completed on 8th January and No.48 Course (by virtue of different training requirements), on the 22nd. There was more snow in February, with no flying at all from 22nd to 27th February, in what the squadron diarist described as, "The worst month that the squadron had so far experienced". But changes were afoot, and with the arrival of the School's first Varsity aircraft in February, the days of Marathon operations were coming to an end. The Varsities were assigned to No.1 Squadron and for the next few months they only undertook conversion sorties for the staff crews before commencing training flights in May. Meanwhile, Marathon servicing was becoming notably labour-intensive and a work study group was formed to investigate ways to reduce the amount of overtime being worked on these aircraft. On 11th February XA268 suffered a nosewheel collapse on landing at Topcliffe. Initially thought to be repairable, it was re-classified as a Cat.5 write-off later the same day. A further Marathon, XA273, was declared a write-off following an undercarriage collapse on landing at Topcliffe on 22nd April. It was later discovered that the starboard drag strut had failed. Incredibly there was one more Marathon loss by No.1 ANS: on 5th May XA253 was written off after yet another undercarriage collapse, this time caused when Flt Lt DC Evers inadvertently selected the landing gear lever instead of the flaps. Evers was tried by General Court Martial on 4th June and severely reprimanded. June 1958 was the last month in which No.1 ANS used the Marathon for navigator training. Just 159 hours were flown, while the ground crew made all efforts to complete outstanding repairs and get the aircraft ready for flying out for storage. The final aircraft, XA269, was flown out to Hullavington on 29th July 1958, Flt Lt DL Davies doing an appropriate 'beat-up' to mark the type's low-key withdrawal from service. There were many who were glad to see it happen.